At Christmas in China, you&apos;ll see many of the same decorations up. Most decorations are made in China anyway! Most Chinese people do not celebrate Christmas at all. This is especially true in rural and minority areas, where Western and Christian influence are negligible. 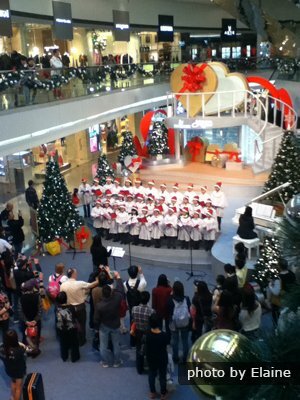 Christmas is not a public holiday in Mainland China. 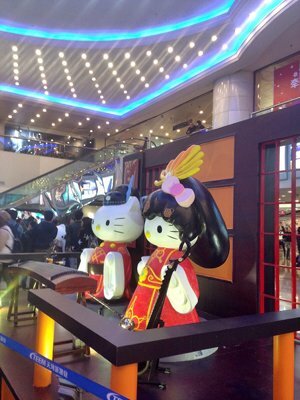 The commercial Christmas has become a major annual event in the major cities in China. On the streets and in department stores, there are Christmas trees, lights, and decorations. You&apos;ll hear Christmas music playing from the end of November, over the noise of the crowds shopping for Christmas season promotions. 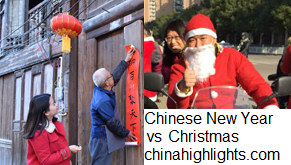 A Chinese "Father Christmas" (圣诞老人 Shèngdàn Lǎorén /shnng-dan laoww-rnn/) helps to make the scene complete. Decorations are put up anywhere that wants to participate in the "international" celebration: hotels, businesses, schools, universities (particularly foreign language departments), even some tourist attractions. Most Chinese people who celebrate Christmas do so as a happy occasion for get-togethers of friends, relatives, and couples. Christmas parties might be held at a friend&apos;s house, McDonald&apos;s, a karaoke cafe, restaurant, or bar. There is a festive atmosphere, and people enjoy the decorations and unusual music. Many younger Chinese see it as a romantic holiday for couples to exchange gifts and date. 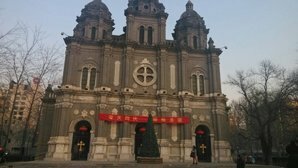 China&apos;s Christians (only 1% of the population officially) generally celebrate Christmas religiously, sometimes more so than in the West. 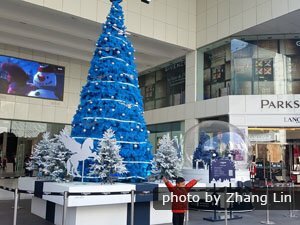 While most Chinese people don&apos;t realize that Christmas celebrates the birth of Jesus Christ or attach any religious significance to the (foreign) festivities, many of China&apos;s Christians celebrate Christmas as the top event of the year, outranking even Chinese New Year, preparing songs and activities weeks before. 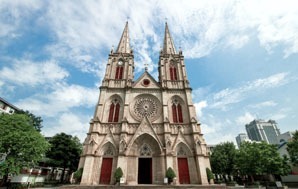 Christians in China celebrate by going to special church services, which are typically packed to capacity. On Christmas Eve, there are choral performances, and the congregation puts on dance and drama performances. Christmas Eve is called ‘Peaceful Evening&apos; (Ping&apos;an Ye 平安夜 from the translation of the carol "Silent Night"). Carol singing in the streets is rarely seen, though it&apos;s popular in Christian&apos;s houses, where the karaoke machine, ever popular in China, may be employed. 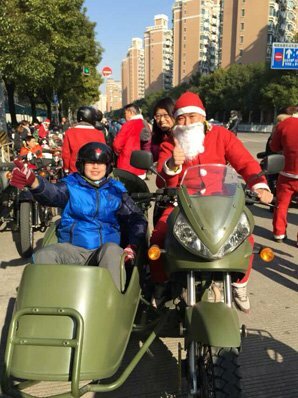 If you&apos;re touring China at Christmas, we&apos;ll do our best to make your trip special. Tourists will find celebrations going on in most major cities, and domestic transportation and hotel rooms costs are some of the lowest of the year due to it being low season in China. Expats (from countries and cultures who celebrate Christmas) decorate their homes and try to generate an atmosphere as much like at home as possible. Many feel particularly homesick at this time of year. Purchasing the trappings of Christmas is becoming increasingly possible in China, especially in the big cities where big malls and Christmas markets sell wrapping paper, cards, etc., and there are import stores for Christmas ingredients. Online shopping is increasingly the cheapest was to get e.g. a Christmas tree and decorations or even a turkey delivered to your door. Expats hold Christmas parties in their homes and often in their schools if they are teachers. A Christmas dinner with family, or at least friends if family are far away, is seen as very important by most. 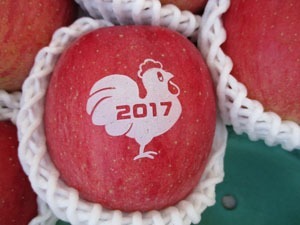 Apples with messages on are given at Christmas in China... and with Chinese zodiac signs on at Chinese New Year. Generally, gifts are not given at Christmas in China, except among expats. Often malls will have a Santa who hands out gifts to children, but these are usually opened the same day. There is no tradition of waiting for Christmas Day to open presents. An unusual apple giving tradition has evolved in the country. Ping in the word &apos;apple&apos; (苹果 píngguǒ /ping-gwor/) sounds like the word &apos;peace&apos; in Mandarin, which is used for Christmas Eve (&apos;Peaceful Evening&apos;), so people give and eat apples, particularly on Christmas Eve. Apples are sold with messages printed on the skin (in Chinese): &apos;love&apos;, love hearts, and &apos;peace&apos; are popular messages. Christmas cards (especially a variety of good ones without English mistakes etc.) can be difficult to find in China, but the situation is far better in big cities and online. E-cards are WeChat messages are popular ways of greeting each other. See our selection of Chinese Christmas e-cards. Many of the larger hotels and some Western restaurants offer traditional Christmas dinners. Many Christmas foods are difficult to find in China: Brussels sprouts, Christmas puddings, even turkeys. However, Internet shopping (Chinese sites like Taobao, rather than Amazon) and import store in the big cities may come to the rescue. Many large supermarkets, and chains like Walmart, may be able to help with the makings of a Christmas meal. Finally, there are such things as Christmas markets in some Chinese cities like Beijing. In Hong Kong, Christmas Day (December 25) and Boxing Day (December 26) are both official public holiday. Banks are closed on these days. Boxing Day is a British tradition. It is a day for shopping for after-holiday sales and for employers to give gifts to employees. There are fewer Christians and Christmas is less celebrated. Famous for its karst landscape, Guilin draws many foreign and domestic tourists, but very few in the winter and at Christmas time. In Taiwan, Christmas is generally celebrated more than in Mainland China, but less than in HK and Macau. Christmas is an unofficial holiday in Taiwan, but only because it coincides with Constitution Day, the anniversary of the signing of Taiwan&apos;s constitution in 1947. 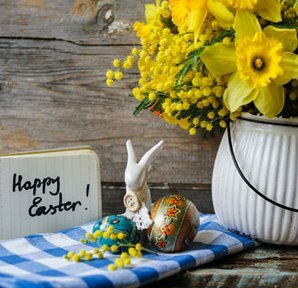 While its 5% Christian population celebrate the birth of Jesus Christ in churches and homes across the island, the majority enjoy the decorations and displays in shops, and general commercialism. 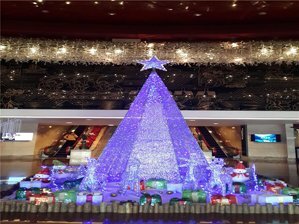 In Macau, Christmas Eve (December 24) and Christmas Day are official public holidays. Both days and December 26 as well are bank holidays. Apart from (classic) English carols and pop songs the Chinese songs you are most likely to hear playing are the Chinese versions (to the same tunes) of "We Wish You a Merry Christmas", "Silent Night", and "Jingle Bells". Lyrics in characters and pinyin, and literal translations, are shown below. 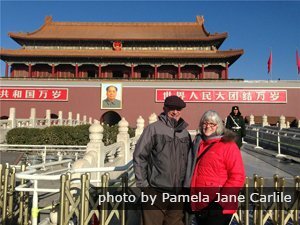 Dingding Dang — "Jingle Bells"
Our customers at Tian‘anmen Square in Beijing, conspicuously lacking any Christmas decoration. If you come to China at Christmas, you should go to one of the biggest cities to appreciate the unique atmosphere. Hong Kong is our top recommendation. 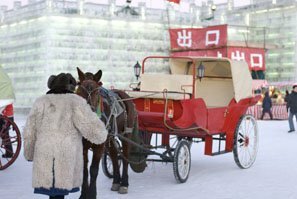 If you venture north as well, you could enjoy skiing around Beijing and the start of the Ice and Snow Festival in Harbin. China tourism low season: The end of December is either busy or a winding down period of work for most mainland Chinese before their big winter holidays at Chinese New Year. So domestic transportation and room rates are lower since it is tourist low season. International flights are more expensive due to students, overseas workers and foreigners travelling during the Christmas season overseas. The Flavor of China — Enjoy warming food in China&apos;s winter (and potentially Christmas food and events) from Beijing to Hong Kong. Contact us for consultancy or a quote on a unique Christmas in China trip.